Port Vale could be the team that relegate League One's bottom club Crewe Alexandra if they win Saturday's meeting at Vale Park. 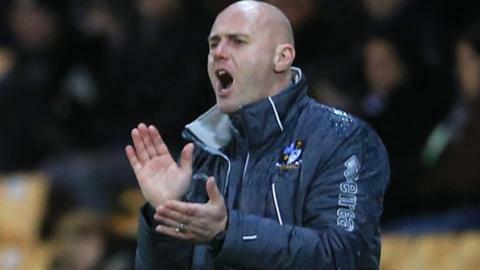 But Vale boss Rob Page goes into the game insisting opposite number Steve Davis is doing a good job, given the financial restraints he works under. "He's done ever so well," Page told BBC Radio Stoke. "Are Crewe ever going to be pushing with a £10m budget at the top of League One? Probably not, no." Steve Davis brought Crewe up to League One in his first season in charge in 2012, beating Cheltenham Town in the play-off final at Wembley. And despite the sale of Nick Powell to Manchester United for £3m and Ashley Westwood to Aston Villa for nearly £2m, they returned to the national stadium the following year. They beat Southend United in the Johnstone's Paint Trophy final, and also flirted with the play-offs before eventually finishing 13th. But since Luke Murphy was sold to Leeds United for £1m in the summer of 2013, they have been locked in relegation struggles, twice staying up on the final day of the season. And, when they allowed their latest prized asset, Ryan Colclough, to move to Wigan Athletic in January, it was the most obvious sign that this time round, they might actually not avoid the trapdoor. With six matches left, Steve Davis's Crewe are 15 points adrift, having won just once in 20 matches. Even if they are victorious at Vale Park for the third season running on Saturday, they would still need five more wins and a lot of other results to go their way to stay up. But Page believes Davis should remain in place to safeguard the club's future development. "He knows what he's got to do," added Page. "And, in my opinion, he's doing a great job. He's bringing the kids through, which is what Crewe have had a reputation for over the years. "He's got to develop those kids and, if they don't develop to benefit the first team, they're developing them to move them on." Crewe midfielder David Fox is one visiting player who admits that there is more at stake than just staying up or going down at stake this weekend. Fox, 32, who signed a one-year deal when he moved to Gresty Road in July 2015, is one of many Alex players out of contract in June. And who will stay and who will go will be determined by the division the club end up in next term. "You want to earn your contract for next season, and there's a lot of us in that boat," said Fox. "Everyone's aim is to stay in the game, whether you're 19 or 20, not had a career yet and are still living at your mum's, or you're 32 and have got a mortgage and kids. Where you go from here, who knows?"